In food industry, the combined treatments based on high-pressure and temperature (HPT) are frequently used to increase the durability of the products without damaging their organoleptic and nutritional properties. However, achieving a reasonable compromise between conservation and quality is usually a challenging task. In a previous work, we proposed a decision tool which solves a multi-objective optimization problem providing a set of pressure and temperature configurations for the HPT equipment in order to adapt the final product to different quality scenarios. The considered optimizer is a population-based evolutionary algorithm that takes the decision maker preferences into account. Nevertheless, when the number of solutions demanded by the decision maker is very large or a high precision is required, the computational time needed by such an algorithm may not be negligible at all. In this work, a parallel version of the optimizer has been designed. This parallel algorithm allows obtaining a greater number of solutions by working with more individuals in the population due to the significant reduction in the total execution time (up to 95.6%). Additionally, using it, we can consider more iterations in the optimization process that lead us to better distributed and more accurate solutions. 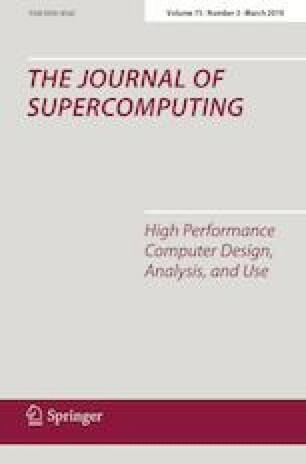 The computational experiments show that the performance of the proposed method is scalable and its speedup is almost linear. This research has been funded by Grants from the Spanish Ministry of Economy and Competitiveness (TIN2015-66680-C2-1-R and MTM2015-64865P); Junta de Andalucía (P11-TIC7176 and P12-TIC301), in part financed by the European Regional Development Fund (ERDF). Juana López Redondo is a fellow of the Spanish “Ramón y Cajal” contract program, co-financed by the European Social Fund. Savíns Puertas-Martín is a fellow of the Spanish “Formación del Profesorado Universitario” program, financed by the Ministry of Education, Culture and Sport. The authors gratefully acknowledge Nicolás Calvo Cruz for his suggestions and kind assistance in the redaction of this paper.